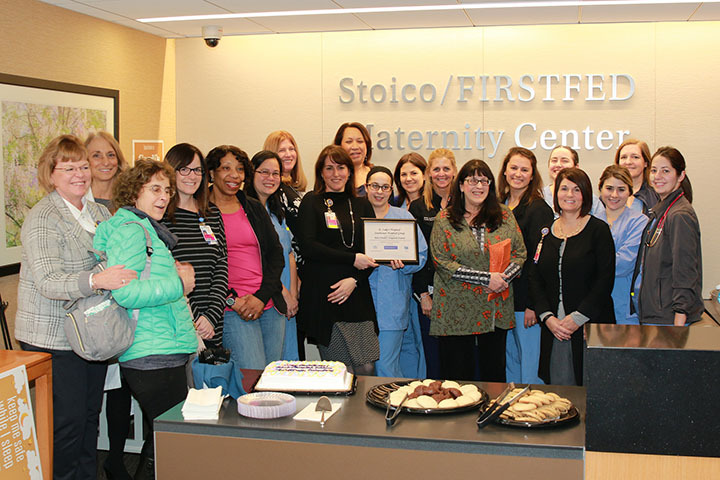 St. Luke’s Hospital announces that it has received prestigious international recognition as a designated Baby-Friendly birth facility by Baby-Friendly USA, Inc.
Based on the Ten Steps to Successful Breastfeeding, a set of guidelines set forth by the Baby-Friendly Hospital Initiative, this designation recognizes birth facilities that offer breastfeeding mothers the information, confidence, and skills needed to successfully initiate and continue breastfeeding their babies. Baby-Friendly USA, Inc is the U.S. authority for the implementation of the Baby-Friendly Hospital Initiative (“BFHI”), a global program sponsored by the World Health Organization (WHO) and the United Nations Children’s Fund (UNICEF). Hospitals must undergo on site assessments by Baby-Friendly USA assessors in order to earn the prestigious designation. The process to become Baby-Friendly compliant began in 2013 and was led by St. Luke’s Baby Friendly Task Force and maternity staff. “This was a team effort with bedside nurses playing an instrumental role in implementing this,” said Kim Pina, nurse manager at St. Luke’s family centered unit.The team also worked closely with various New Bedford community service based organizations such as WIC and the Greater New Bedford Community Health Center. This is the second Southcoast Health Hospital to receive this designation. Tobey Hospital was designated Baby-Friendly in 2011. There are more than 20,000 designated Baby-Friendlyhospitals and birth centers worldwide. Currently there are 546 active Baby-Friendly hospitals and birth centers in the United States. The Baby-Friendly Hospital Initiative is a global program sponsored by the World Health Organization (WHO) and the United Nations Children’s Fund (UNICEF) to encourage and recognize hospitals and birth centers that offer an optimal level of care for infant feeding. The initiative encourages and recognizes hospitals in giving breastfeeding mothers the information, confidence, and skills they need to successfully initiate and continue breastfeeding their babies. For more information visit http://www.babyfriendlyusa.org/.